Adreian Payne had a career-high 41 points for the Spartans on Thursday. 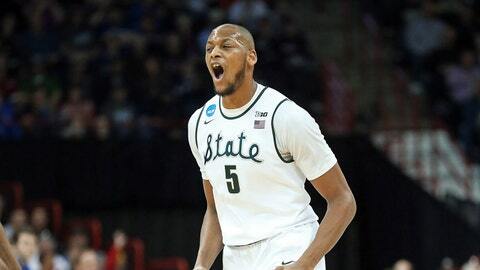 Adreian Payne sent Tom Izzo a text. He wants to leave a legacy. The 6-foot-10 senior played the game of his life Thursday, scoring a career-high 41 points to help fourth-seeded Michigan State look every bit like a March Madness favorite in a 93-78 victory over Delaware. "He was playing in another zone, not even in the ozone," Izzo said. "He was in Pluto and beyond." This marked the first 40-point performance in the NCAA tournament since Stephen Curry did it for Davidson in a win over Gonzaga in 2008. Payne set a school tournament scoring record, surpassing the 34 points Greg Kelser scored during Michigan State’s 1979 title run led by Magic Johnson. Payne’s overall line: 10 for 15 from the field, 4 for 5 from 3-point range, and a tournament-record 17 for 17 from the free throw line. He chipped in eight rebounds, too. "Forty-one is 41, and he was a load tonight," Delaware coach Monte Ross said. "He was probably the best big man that I have faced in 21 years of college basketball." Payne thought long and hard about leaving for the NBA after last season. He decided to stick around to see if he could lead Michigan State to another Final Four. Asked what his best night — at least so far — in a Spartan uniform means to him, Payne said, "Leaving a legacy." "I talked to Coach about that," he said. "The other day, I sent him a text and we’re just trying to win games. We are here to win the weekend and that’s the main goal." Michigan State’s next game is Saturday against 12th-seeded Harvard, which beat Cincinnati 61-57 earlier in an earlier East region contest. Though his entire performance was sublime, it was never better than during a 105-second stretch midway through the first half. Payne scored 12 straight points to help the Spartans (27-8) open an 18-point lead over the 13th-seeded Blue Hens (25-10). Those points came three at a time — a trio of spot-up 3s and one ridiculous, spinning left-hander from the paint while he was being mugged by Carl Baptiste. Payne stepped to the line to make the free throw with his right hand — the hand he shoots most of his shots with — and by then, he had pretty much proven his point. "He made the right decision to stay," Izzo said. "He’s a much more cerebral player, he’s a much stronger player. He is starting to marry the inside-outside game. And if he does that on a consistent basis, I see him as one of the best `4′ men in the whole country." With the game out of reach — but Izzo less than satisfied with what he called an uneven effort — Payne played almost to the end and the Spartans fed him. He dunked with 4:26 left to reach his career high and break Kelser’s record. Points Nos. 40 and 41 came on free throws; the second one gave him the record for most makes in an NCAA tournament game without a miss. The previous holders are a couple of unforgettable names: Bill Bradley (1963, Princeton) and Fennis Dembo (1987, Wyoming). "When you’re scoring like that and your game’s coming so easy to you, and you make a lot of shots, it feels like you’re in a rhythm," Payne said. "It feels like you can’t be stopped." For the brief moments Delaware did stop him, others stepped up. Travis Trice scored 13 of his 19 points in the second half to prevent the Colonial Athletic Association champs from turning this into a game. Branden Dawson, the Big Ten tournament’s most valuable player, finished with 10 points, eight rebounds and four assists — modest on this day. It was that run through the Big Ten that turned Michigan State into a trendy pick in brackets across the country. President Barack Obama has the Spartans winning it all, and Las Vegas has them favored along with Florida and Louisville. Devon Saddler had 21 points and Davon Usher added 20 for Delaware, which made its first NCAA appearance since 1999. Ross looked at it all with a sense of awe. He thought his team played pretty well. He still can’t believe Michigan State is a No. 4 seed. "I’m only reiterating what the whole country is saying," Ross said. "If the country is saying you’re the odds-on favorite to win the national championship, you’re not 16th best in the country."